As this product belongs to step 2 care treatment (PH Balancing) among three-step management program (scalp scaling-PH balancing – nourishing) of a scalp treatment shop, the product prevent scalp troubles and helps to regulate a balance of the oil and moisture in the scalp by providing a PH concentration (4.5 ~ 5.5), an ideal scalp condition. -After the Step 1work (scalp scaling) is completed, evenly apply the product to your scalp with a thick cotton swabmoistened with the product by taking about 7ml from this product containerwith the pipette. Scrub and wipe the product evenly as if you make a circle. working time is usually 10 minutes or less. -After this, shampoo your hair and have your hair dried fully. as a stable amount of subum secretion prevents growth of bacteria and loss of moisture, acting as the hair’s shield, it is important to provide an environment such a protective shield of sebum as it is. In addition, the hair is configured of mostly protein called keratin. Because the keratin is sensitive to a PH level of the scalp, it can be solved by the alkali and coagulated by the acid (thus easy to break). Thus, it is important to keep a stable environment of weak acid in hair in order to protect the hair from alkaline shampoo, perm, and dyeing. The product contains a Portulaca Oleracea extract, which calms skin irritation and allergic reactions and has antibacterial and antifungal effects. As the product contains edible plant sulfur extracted from pine trees, the sulfur can make skin improvement and protective action on the scalp and allergic skin. After the Step 1work (scalp scaling) is completed, evenly apply the product to your scalp with a thick cotton swab moistened with the product by taking about 7ml from this product container with the pipette. Scrub and wipe the product evenly as if you make a circle. Working time can vary depending on a state or the scalp or the ancillary equipment used. However, working time is usually 10 minutes or less. After this, shampoo your hair and have your hair dried fully. Effective at deep cleansing by removing waste products, dead skin, sebum, and contaminants that have accumulated in the scalp and pores, this product also opens up previously blocked pores while soothing your scalp and helping to restore the sebum and water/oil balance. 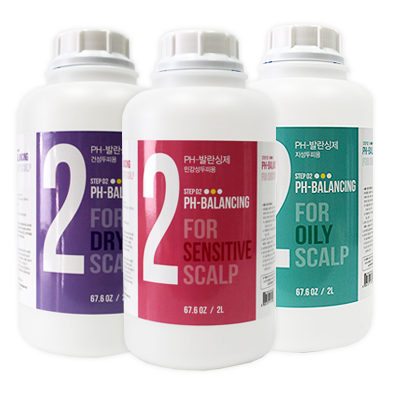 The product restores the sebum layer pH concentration to a slightly acidic state (4.5 to 5.5) through a pH balancing stage required in scalp and hair management to prevent scalp trouble while blocking moisture loss and germ reproduction in the scalp and hair by ensuring a stable release of sebum. Provides help to maintain healthy hair and a healthy scalp by directly providing nutrients to hair roots with over 10 types of diverse nutrients for hair growth including marine plants such as seaweed and kelp as well as grains. Typically, soap or regular shampoo with alkalinity has excellent detergency. The stronger the alkalinity is, the more dilated the Macro fibril is so that the penetration of foreign material is easily made between tissues. These principles are adapted to hair perm or hair dye. Thus it is important to have a protective film at a weak acidic state, which is an optimal status, in order to protect the scalp and hair from the environment.